One might assume that the process of placing a pod into a single serve maker, and brewing that delicious, on-demand espresso, is simple and straightforward; however, by taking a deeper dive into the development of that pod, it is remarkable to understand the great degree of art and science packed into one small product. Let us take a journey into some of this understanding. The invention and development of a coffee normalizing system that “compacts” the coffee without loss of integrity. Additionally, both technologies need to operate in a water-cooled (chilled) and precisely controlled environment to ensure that the coffee exiting the grinding system is as cool, and full of aromatics and volatiles, as the beans that entered the grinding system. 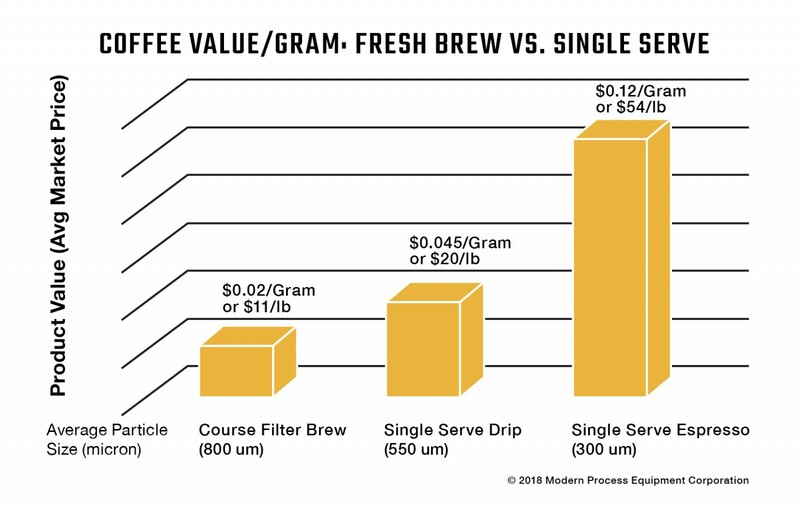 The result: The above grinding equipment considerations allow for the higher value single serve product, equating to a product value increase of close to 600% (as compared to, say, a fresh brew product). For example, a coarse filter brew grind of, roughly, 800 micron (um) will have a retail value of $0.02 - $0.03 (USD) per gram, while a sophisticated grind in a capsule will sell for approximately 100% more ($0.04 - $0.05 per gram). Similarly, an espresso-style grind will sell for 600% more than the filter brew ground value, or $0.12 per gram (Example 1). The most important concept in coffee grinding technology in general, and single serve in particular, is the managed extraction of the soluble solids from the colloidal structure of the coffee cells within the coffee bean, as shown below. This concept is the "secret sauce" of coffee brewing, and if the extraction rate is low, coffee strength is compromised; conversely, if the extraction rate is excessive, there is an extraction of some of the lesser desirable components, which is deleterious to the achievement of the optimal brewed coffee result. Below (Example 2) is a much-magnified view of ground coffee particles using an electronic microscope. The cellular walls are about 30 microns in diameter, and the colloidal material fills the voids within the ground coffee and cellular structures. Part of this colloidal material is what we want to extract, but with a limit. The extraction of soluble solids from the ground coffee particles is a function of the exposed surface area of the ground coffee to the extraction media, in this case water (hot or cold). As the area exposed to water increases through grinding, the greater the extraction due to the area exposed to the water. The following table (Example 3) demonstrates this relationship. This empirical illustration illustrates that there is a lower and upper limit to desired extraction, with too little extraction resulting in a weak, underdeveloped brew and too much extraction resulting in a bitter, off tasting brew result. The next goal is to optimize the mean, or average, particle size of the ground coffee precisely to the desired exposed surface area, given the brewing methodology. In addition, to make things more difficult, it is critical to optimize the mean particle size for the brewing method, as well as optimize the percentage of particles in the desired particle distribution range(s). 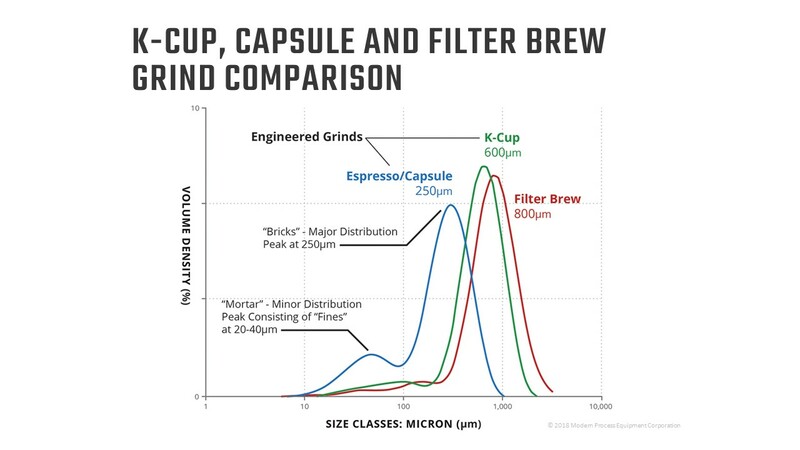 The following graph (Example 5) shows the difference between a standard filter brew, “K” cup and espresso grind. It is important to note the “bump” on the espresso grind profile, which is desired for the unique “bricks and mortar” grind profile of an espresso product. Comparing the brew time of a pour over or bottle brewer against that of a capsule, one can see over a 90% reduction in the brew time and yet, it is necessary to achieve the same soluble solids (not more, not less) as shown above. All grinding is important for proper brewing, but the margin of error, and the technical consideration of capsule grinding, is critical for not only brew strength, but also for time. Think about an espresso brewer, and specifically how the particle distribution can affect the time it takes to brew the espresso. Similarly, with capsule grinding, there is a further need to “tweak” the grind so that it brews in the given amount of time (ref. Example 6). This is especially the case with espresso style capsules, wherein there is a combination of particle sizes, which, on the one hand, provide the ideal extraction and, on the other hand, provide the “mortar” between the other particles. Densification can be characterized as the fluffiness (or conversely, the non-fluffiness) of the coffee so that it can fit efficiently into a capsule at a rate of up to 1600 capsules per minute. Example 7 shows the comparison between two capsules and the amount of coffee packed into each. In each case, the volume is the same, but the quantity of coffee is different. The difference is the density, or “compactness”, of the coffee, which is achieved at the grinder, for each ground coffee product, with the Vortex™ densifier/normalizer. The first technical achievement in normalization, as represented by the Vortex™ normalizer, allows more ground coffee to fit into a defined space such as a capsule. Since coffee is an organic product that has different density characteristics depending on its origin, and is roasted to various degrees, the density, or fit, of the coffee into the capsule must be a dynamic process in order to meet the specific density requirement. The second critical element in normalization is the density control system, which must provide unparalleled consistency in density over time, thereby providing a “set it and forget it” confidence. If the art is contained in the development of the optimal (taste and strength) parameter control adjustment, the science is provided by the ability of that control system to provide consistency and repeatability over an extended period. The particle size and distribution has to be correct for the specific type of single serve capsule. The granulometry distribution of the ground coffee must first be optimized to meet the design of the single serve capsule (mean particle size) as well as minimize the ground coffee particles that fall outside that range. The coffee grinder must be capable of producing a grind that can control the brew time of the capsule through the granulometry design. 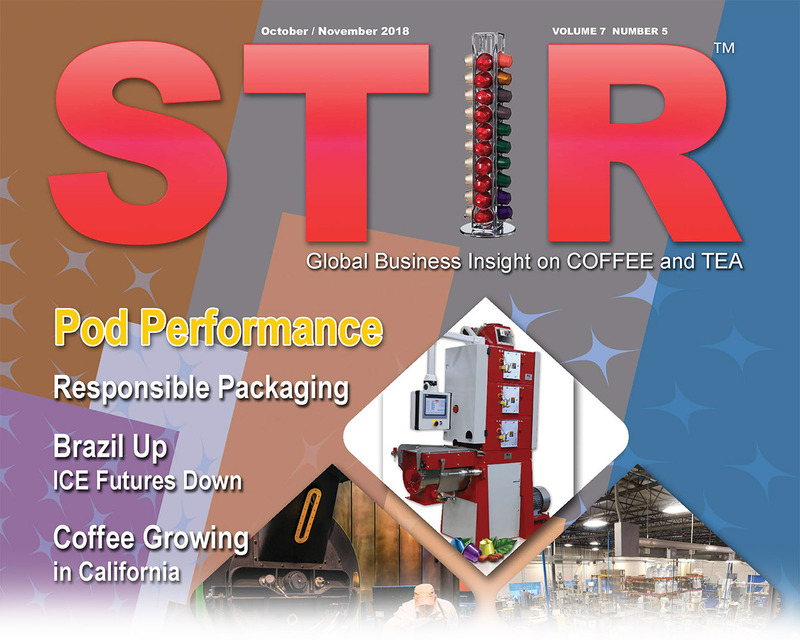 Control of the density of the coffee is critical so that the optimal amount of coffee will not only fit into the capsule, but also do so under high-speed packaging conditions. All of the above must be achieved while the process operates in a water-cooled (temperature-controlled) environment. Obviously, having to control these variables, simultaneously, is virtually impossible on a manual basis, and, accordingly, PLC controls with recipe(s) for each parameter selection is a crucial part of a single serve grinding system. Let us now resurface from our short journey to a better understanding of the making of the coffee pod grind. With this greater knowledge, there will be an elevated level of appreciation for the daily single-serve cup of coffee. With experience in the coffee business for over 40 years, Daniel Ephraim has been active in the development and design of coffee grinding and other related processing equipment. He has presented at numerous coffee conferences and symposiums and conducted hundreds of coffee grinding seminars throughout North America and overseas. His company, Modern Process Equipment Corporation, is based in Chicago, Illinois.